By Rachel Held Evans, on January 25, 2018. 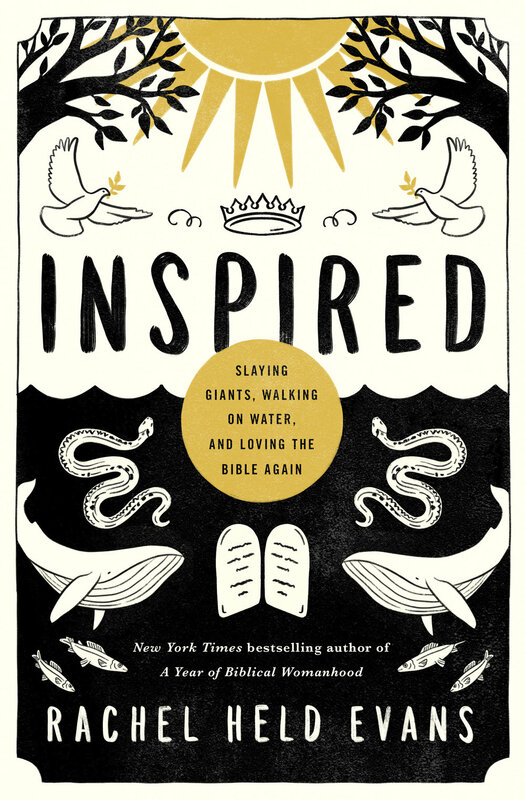 So begins the first pages of my next literary endeavor, Inspired: Slaying Giants, Walking on Water, and Loving the Bible Again, available now for pre-order and officially releasing June 12, 2018. This is a book about the Bible. And it’s unlike any other book I’ve ever written, for in addition to the memoir, it includes original poetry, short stories, soliloquies, and even a short screenplay—all aimed at capturing the wonder and beauty of Scripture, while honoring the best in biblical scholarship and acknowledging the challenges of its most difficult passages. My hope is that this book will rekindle in you a childlike love for the stories of the Bible, but in a way that engages the heart and mind, your faith and your doubts. I’ve been hinting about the book on social media, but today I get to reveal the title and cover, both of which I love. Thanks to my editor, Jenny Baumgartner, for helping me land on the title (after hours of discussion and a bunch of polls, to which many of you contributed), and to the cover’s designer, Connie Gabbert, and the art director from Thomas Nelson, Belinda Bass. This was a team effort and I’m thrilled with the results. I’ll be revealing more about the content and vision for Inspired in the weeks and months ahead. But in the meantime, if you jump over to Twitter and re-tweet my announcement there, you’ll be entered to win a FREE ADVANCED COPY! Or you can pre-order here. Spring Schedule: See you in Dallas, Palm Beach, & Durham!